MS SQL Server and MySQL use similar data types, but have some important differences. In order to get correct data after migration you have to do some mapping. This article describes the most important data types in MySQL and their MS SQL Server equivalents. TINYINT tinyint MS SQL tinyint is always unsigned. If not unsigned, the MySQL TINYINT datatype can range from -127 to 127; whereas the SQL Server TINYINT type always ranges 0 to 255. 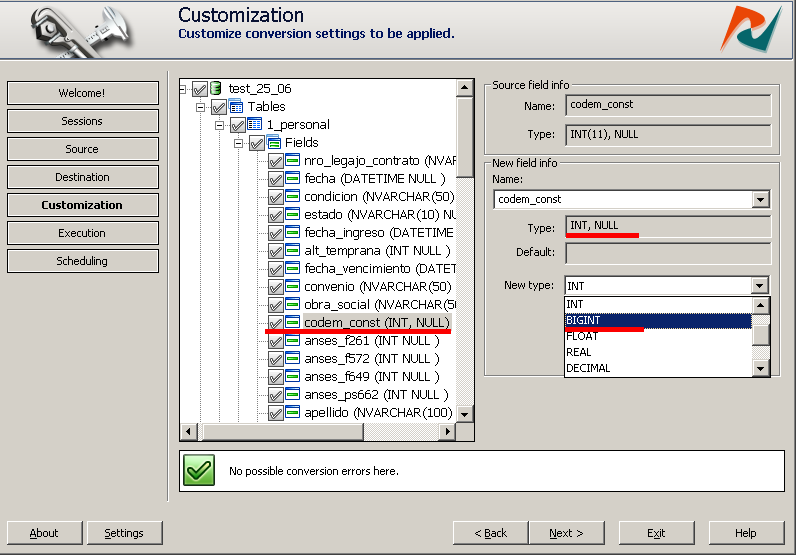 So, unless it is an unsigned TINYINT, a MySQL TINYINT datatype should be converted to the SQL Server SMALLINT datatype. All MySQL integer types can have the optional UNSIGNED attribute. Unsigned integers take non-negative numbers only, but with a larger upper numeric range. Though, this will not work for the unsigned bigint. They have a larger Int64 type in SQL Server, but there are problems with handling of the BIGINT type. So, that is the reason that forces you to give up up-casting unsigned bigints to SQL Server. You will likely have to convert the bigint data to string values. DECIMAL(M,D) decimal(p,s) Default precision is 18. The maximum precision is 38. Float or double data types are used for decimals with precision more than 38. Date and Time data types. *These date and time data types introduced in MS SQL 2008. If you don’t use the NO_ZERO_DATE SQL mode, MySQL allows you to store ‘0000-00-00’ as “dummy dates”. Besides, invalid DATETIME, DATE, YEAR, or TIMESTAMP values are converted to “zero” equivalents of the corresponding type. Otherwise, SQL Server can’t store “zero” dates and it is recommended that you represent zero date values as "1753 January 01". As well, string or number data types can be used for storing zero dates. If ALLOW_INVALID_DATES flag is turned off, MySQL verifies that month value is in the range between 0 and 12 and day is in the range from 0 to 31. New DateTime2 Data Type introduced in Microsoft SQL Server 2008 is able to validate date and time values as well. VARCHAR, TINYTEXT, TEXT(M), MEDIUMTEXT, LONGTEXT nvarchar(n|max) nvarchar allows 4000 characters but max indicates maximum storage size of 2^31-1 bytes. In MySQL, ESCAPE sequence in a string literal begins with a backslash (‘\’). Our software performs this type of transformation automatically. VARBINARY(M), TINYBLOB, BLOB, MEDIUMBLOB, LONGBLOB varbinary(n|max) nvarbinary allows 8000 bytes but max indicates maximum storage size of 2^31-1 bytes. Our programs can handle data types conversion automatically before migration keeping correct data at destination. They throw a warning message, if there is a potential problems with trimming of data. Global Data types mapping may be configured. The whole database will be affected. Or Optionally you can map data types for certain fields manually.